Record audience tuned in for the February 17, 2013 Lawless America Show on TalkShoe. The topic was filing criminal charges against those who have committed crimes against us, and that has been perhaps the hottest articles ever posted on LawlessAmerica.com. The original article about this was read by tens of thousands of people on LawlessAmerica.com and set a record with 7,933 Facebook Likes. So, there are a lot of people who want to join in this effort, and I am happy to help. Our best hope, perhaps our only hope, to get judicial corruption and government corruption addressed is with our local grand juries. People all across America will file corruption charges with their local grand juries in April. There is no cost to file, and there is no cost for help from the Lawless America Family and me. The show on February 17 provided an overview of the plans and focused on the various crimes that may have been committed in the cases of victims. The two-hour show lasted 3 1/2 hours. 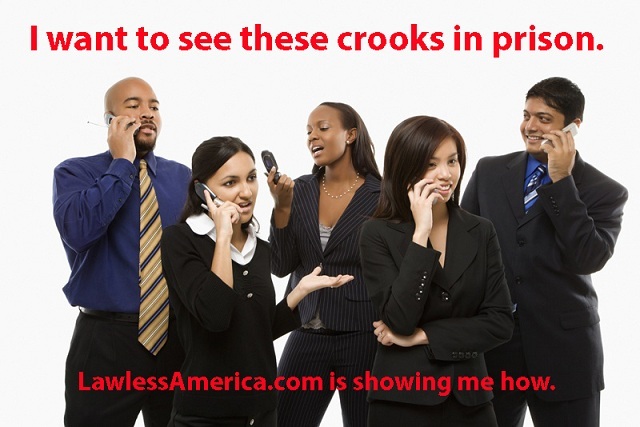 Sunday night, February 24, 2013, the Lawless America Show will begin at 9:00 pm and last until at least midnight. Please tune in. PLEASE DON'T TAKE ANY ACTION YET. READ THIS MATERIAL, RESEARCH, AND PREPARE, BUT WAIT FOR FURTHER INSTRUCTIONS FROM THE LAWLESS AMERICA REVOLUTION BEFORE YOU MAKE ANY CONTACT. The goal is to get your fellow citizens (the grand jury) to agree that criminal charges should be pursued against judicial corruption or government corruption -- whatever you have valid CRIMINAL complaints about. You cannot take civil complaints to a grand jury -- only criminal complaints. So, make sure you have a valid criminal complaint. Know that just about everyone with any government authority will be out to stop you. That goes from the receptionist to the bailiff to the janitor. They will ignore you, refuse to help you, refuse to do their duty, lie to you, and more. Your mission must be to overcome all obstacles. It takes PERSISTENCE, creativity, and guts. The District Attorney will claim that you do not have the right to present charges to the grand jury directly. This is not true. Any citizen has the right to notify a grand jury of criminal charges. When the DA makes such a claim, demand in writing that you be shown the statute and case law to support this position. The DA will be unable to do so. First, know everything that you can about what you are going to be doing. Lay all necessary groundwork. 1. Research your state's statutes on grand juries. Determine what types of grand juries exist in your state, and determine what the laws are relative to grand juries. A Yahoo search for (your state) criminal statutes will probably return what you need. The searches to do are: (your state name) grand jury -- (your state name) grand jury presentment -- (your state name) grand jury procedures. (This is the Georgia statute on grand juries.) Check your state's laws on Special Grand Juries. Press *67, and call the general information number for the county, and they will give you the district attorney's number. Don't identify yourself or provide any information if you don't have to. Simply ask: When and where does the grand jury meet? Is there a grand jury inn session now? What days do they meet, and what time do they start each day? Visit the grand jury area before you do anything else just so you will have the lay of the land for when you or an agent delivers your sealed envelopes. Be able to tell an agent where the grand jury room is, where there is someone posted who may deny access, etc. Casually ask the name of any receptionists or security people. Take notes of everything. 3. Check the U.S. Department of Justice website to determine the name and contact information for the U.S. Attorney responsible for the area where the crimes took place. 4. Research the state and federal statutes for the crimes that you feel were committed. Note the statutes as you will need to cite them. Identify the specific federal and state statutes that you believe were violated and the names of the people who violated each. Index to each state's statutes. If your state has a RICO Act, study carefully the predicate acts. These are crimes that must have been committed for RICO to be applicable. Those state and federal statutes will be the key ones for you. If you missed the February 17 Lawless America Show, I encourage you to listen to the recording -- Episode 100. Do a first draft of your letters. Tune in Sunday, February 24, 2013 from 9 pm to midnight Eastern Time for the next TalkShoe show discussing how all of this will be done. State by State Analysis of Right of Citizens to present Criminal Charges to a State or County Grand Jury and Links to Statutes, etc. I am not an attorney. I cannot give legal advice. Please make your own determinations or seek legal advice should you know an honest attorney. This manual is intended purely as a communication of information in accordance with the right of free speech. It does not constitute either general or specific legal advice. Anyone seeking legal advice should consult a competent professional. Neither the author, editor or publisher guarantee that using this information will result in success or protect the reader from harm. The reader must accept that risk, and thoroughly study the law before using any of this material. Readers must take full responsibility for the consequences of any actions taken based on the contents of this manual.